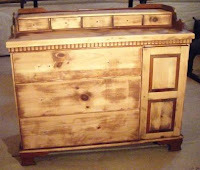 Diary of a Children's Book Writer: The Dresser Unveiled! I know I just wrote about not wanting to skip days writing, but today was a really good day and a long time coming. Three months ago, I promised my daughter I would refinish her dresser. 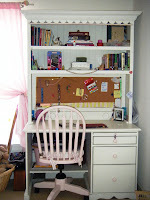 She had just inherited furniture from my baby sister and it made her old dark stained, early American dresser stick out like a sore thumb against her new furniture in white with pink accents. The furniture also had a black undertone and a bit of crackling. At first, I looked at the new stuff and said, "I can do that no problem..."
Then I had to paint the whole thing black. (I see a dresser and I want it painted black... no colors anymore, I want them to turn black... my tribute to the Rolling Stones, thank you) I could swear I took pictures of that step, but they seem to be missing from my camera. Next, I painted on a coating of crackle glaze. The crackly was old. Really old. I probably should have bought a new bottle, but I'm a Capricorn, and well we're um... practical... so I used what I had. When I painted the white paint on top... Ay, yi, yi! What a headache! Anytime my paintbrush touch a previously white painted spot, it would take all the white off with it. So the whole dresser would look the same, I had to endure the frustrating task of painting everything even though the crackle was so frustrating to work with. I've crackled before and this has never happened! Then, once everything dried, I sanded everything all over again. Not all the way down to the wood, but enough just to smooth out all the horrible spots of very bumpy white. Then I applied a very thin coat of crackle in key locations (instead of the whole piece) and let it dry for... a few weeks. Then I applied another thin layer of white and let it dry for... well... a few more weeks. Then finally, yesterday, I figured out if I water the white paint down, it might be easier to work with. DUH, it was!! I painted everything with the very watered down white and it came out great! Three months later, but great nonetheless. 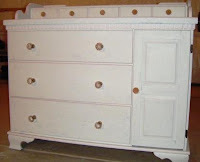 Last, today I applied some accent areas in a light pink and put on the new knobs and viola! 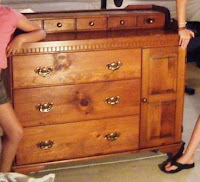 A brand-new dresser and honestly, when it was placed in her bedroom, you cannot tell that the dresser didn't come with the set! So after all that, it finally paid off and looks really fantastic and I am very, very proud of myself. It took forever, and my poor daughter had to live with her clothes in baskets and on racks for three months, but she hardly ever complained and was a real trooper. Today, she said it was worth the wait. 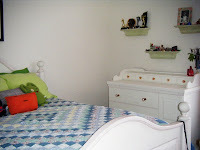 Having all her furniture back together like one happy furniture family, inspired us to organize her room. We went through all her clothes, made piles for good will, piles to put away for the summer and changed over all her clothes to winter clothes. Then, we organized her closet, vacuumed behind furniture we couldn't get to in a while, put on fresh, new sheets, and she said she felt like she just moved in. Tomorrow, I'm home all day with no plans accept to write, write, write. I am feeling, light, free, and ready! I hope to add some serious bulk to my word count then. But for now, I feel terrific! Well done, Sheri. The dresser looks fabulous. And now you have a full day free to write. If you're like me, you'll feel especially liberated in your creative work today because you so clearly earned today's freedom yesterday. Enjoy! Oh how beautiful! I did a dresser about a year ago. It IS a great deal of work, but in the end it's so rewarding. Sort of like writing, huh? This is such an amazing and inspiring post, Sheri! I love it! You're taking it one step at a time, admitting and learning from mistakes, and finishing with something amazing! It's just like writing a book except even better! That's awesome. The dresser is beautiful. Doesn't it feel great to accomplish projects like that? I love that feeling. Jeanie, Thanks! And you were right, I did feel liberated to write today! Amy, so you know the pain I went through! Not as easy as it looks, right! PJ, Thanks so much! Everthing hard but worth the effort can be related to writing, right? I'm glad you found my tale so inspiring! It was inspiring for me too. I wrote 5,000 words today! Casey, your word count certainly chased me today... or I guess I should say I chased it! Nice healthy competition never hurt anyone!